Earlier this week, I explained why every man should know how to repair his own furniture, and offered some tips for mitigating the need for such mending. In this concluding installment, I’ll go into the how of furniture repair: the basic tools to have, the joints to know, and the instructions to get things fixed up right. This is the single most important tool you’ll need. Adhesive choice can make or break the long-term success of a repair, so don’t try to one-up the artisans of the past. Ancient Egyptian tombs were discovered with furniture still standing thanks to the strength of hide glue. The reason historic furniture survives use for hundreds years is because it was glued with this adhesive. Hide glue is exactly what it sounds like: an adhesive made from the skins of animals. 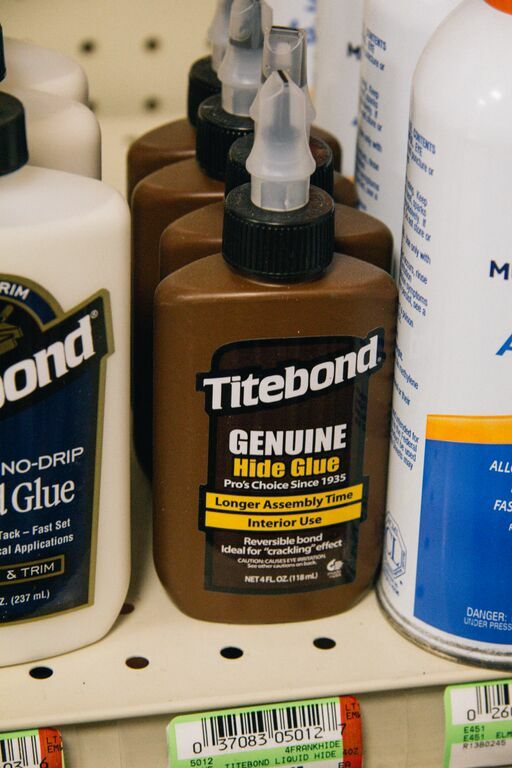 Furniture grade hide glue comes from cattle hides. The hides are heated in a water bath to extract the gelatinous glue. Once drained off and dried, the glue is ground into granules for sale. Some manufacturers then add ingredients to it to alter the working properties to make it easy to use for repairing wooden objects. The real beauty of hide glue is that it will dissolve again when hot water is applied directly to it. This makes repairability not only easy but successful. Modern synthetic glues seal the surface of the wood, guaranteeing that no glue will ever be able to be used on top of it again. Every glue fails eventually. Believe me. I see failed joints all the time full of Gorilla Glue and these repairs take the most time to do. Put simply, once a fancy-pants modern synthetic glue is used, no future glue will ever make the joint as strong again. And when you do try to repair it in the future, good luck trying to safely disassemble it. Another benefit of hide glue is its strength. It’s the epitome of the Goldilocks principle: not too weak, not too strong, but juuuust right. Don’t buy the marketing about the strongest glue on the planet. You don’t want that. The glue line in a joint is supposedto be the sacrificial element in the system. Think about it: when the chair falls backwards on the floor, what do you want to fail, the glue line or the wooden components? Adding more glue into a joint is way easier than trying to repair a severed tenon. The easiest and most readily available form is Franklin’s Liquid Hide Glue. This little brown bottle can be found at many hardware stores. Another alternative is Patrick Edward’s Old Brown Glue. Watch the shelf life and you’ll be all set.